You are here:Home/Get a BMO® MADD Mastercard®* today! BMO is one of MADD Canada’s long standing community partners. We are working with BMO to build a successful Affinity Card Program… one that not only generates revenue to cover the costs associated with delivering our Victim, Survivor and Youth Services but also offers valuable benefits that personally reward you for using the card! If you prefer, choose a BMO MADD Canada CashBack®† MasterCard and get 1.0% CashBack on all your card purchases³. 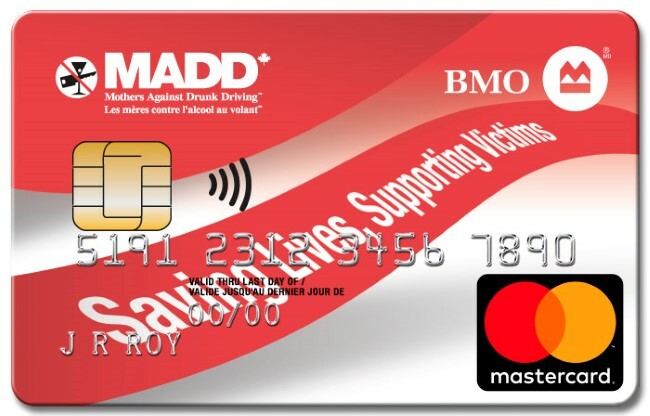 When you shop with your BMO® MADD Canada Mastercard®* from BMO® Bank of Montreal, every purchase you make helps support MADD Canada stop impaired driving and support victims – at no additional cost to you. Limited time offer: Get 5.0% cash back on all your card purchases in your first 3 months.⁵ That’s $5 cash back for every $100 spent on the card. ® Registered trademark of Bank of Montreal. ®* Mastercard is a registered trademark, and the circles design is a trademark of Mastercard International Incorporated. Used under license. ®† Trademarks of AM Royalties Limited Partnership used under license by LoyaltyOne, Co. and Bank of Montreal.